The Erasmus Student Network has been awarded the Charlemagne Medal for European Media (Médaille Charlemagne pour les Médias Européens). This medal has been awarded since 2000 in the run-up to the Charlemagne prize ceremonies to a European personality or institution, who or which has or have particularly served the process of European unity and the formation of a European identity in the field of the media. The award ceremony will take place on 23rd May in Aachen. By awarding this 19th Charlemagne Medal, the board of trustees of the “Médaille Charlemagne” is honouring the network’s services as trans-European. ESN, as a student association, not only supports students in completing a semester abroad but also basically pursues the goal of bringing together people from different cultural backgrounds. In its justification, the board of trustees accordingly states that a united Europe can only function when people start to think of themselves as European (although without losing their national identities). “It is essential that we get to know other countries, their cultures and mentalities for this purpose. Relationships are built up and resentment reduced by studying and living in a different country, by meeting and exchanging views with foreigners. We need curious young people who are open to the world. As supporters of a united Europe, they must stand up for its values. In an age when the voices against a common Europe are growing ever louder, the ESN publicly stands up for a united Europe”. The Erasmus Student Network is one of the largest, interdisciplinary student organisations in Europe. It looks after exchange students, who usually have a place on the Erasmus programme, and helps them become integrated in the locality. The network is made up of 529 sections in 39 countries throughout the world, which support a total of 350,000 students on Erasmus scholarships. The prize is donated by the “Médaille Charlemagne pour les Médias Européens” association, to which the following institutions belong: the City of Aachen, the City of Maastricht, the German-language society of Belgium, the NRW State Institute for Media Film- und Medienstiftung NRW GmbH, Arte - the European cultural broadcaster, BBC World News, Deutsche Welle, EOS Entertainment GmbH, Euronews, Discovery Networks Deutschland, Zeitungsverlegerverband Nordrhein-Westfalen e. V. and Gesellschaft für die Verleihung des Internationalen Karlspreises zu Aachen e. V. The association was founded in 2006 on the initiative of the NRW State Institute for Media and the City of Aachen. Among the long list of prize winners of the Médaille Charlemagne we can find well-know initiatives as the Eurovision Contest (2016) or the European Film Academy (2014), as well as personalities of the world of arts and letter as the publicist Lord George Weidenfeld, the producer Jan Mojto or the director Jean-Jacques Annaud. 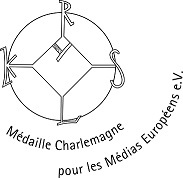 Check more about the Médaille Charlemagne pour les Médias Européens at www.medaille-charlemagne.eu .